In the past 89 years, Psi Chi chapters have done a LOT of good in their communities! 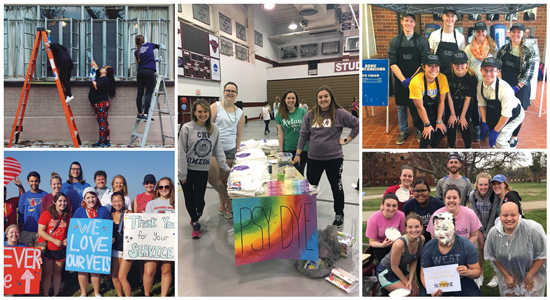 From pie-in-the-face contests to mental health awareness weeks, there is no limit to what your chapter can do or the number of people your efforts can affect at your campus and beyond. Here are some service project ideas to consider for your local chapter! Chapters frequently also host student research conferences and educational events about career advice, getting into graduate school, and fields of psychology. Announce the event repeatedly at Psi Chi chapter meetings and other events. Create flyers, social media posts, blurb quotes, and descriptions of the event. Request for details about the event to be shared on any chapter webpages, emails, bulletin boards, blogs, social media, etc. Ask your professors to tell their students about the event. To increase member engagement, ask around and select an event type or philanthropic “cause” that your members are passionate about. Establish a timeline and a sign-up sheet so that members can volunteer for specific responsibilities (e.g., acquiring sponsors, food, room acquirement, flyers). Collect volunteers’ contact information, and check in with them from time to time to see how they are doing. Encourage your members to give you their ideas and feedback early. Launch and maintain a Facebook Event page. Maintain an email list of potential supporters, chapter members, and interested participants. Before the event, let everyone know that you appreciate their support, and provide clear instructions for how they can share your flyers and other materials to help you promote the event. Write a press release for local media sources such as newspapers, television news stations, university news, local organizations, etc. Seek out the support of your psychology department to help spread the word about the event via social media, email, and other methods. Reach out to nearby Psi Chi chapters and invite them to join you! You can identify nearby chapters with our Chapter Directory Search tool. Invite a relevant guest speaker to attend the event. Entice and reward your volunteers with free tickets and other benefits. Decide on a hashtag and promote it often. Create and share a Q&A of any popular questions you receive. Specially invite any relevant opinion leaders in your area such as professors and other experts. Ask them to attend (and share about) your event! Host (and record) a mini “preview” event that you can share to build hype for the official event. If it costs money to attend your event, consider offering an early-bird discount. Host a free-tickets giveaway or raffle items at the event itself. People love food! Let everyone know if there will be free or purchasable refreshments! Share portions of the event on Facebook Live. Ask participants for testimonials about the event. Keep detailed notes of your promotions strategies so that future officers will have the best chance to succeed if they decide to host the event again next year. Share about the event, even after it’s ended! Sharing pictures and video clips, participants’ feedback, sponsors who made the event possible, etc. will express your appreciation to all parties involved and build hype for future events! What other ideas do you have to promote your chapter events? Please share them below (login required). Our Chapter Hosted a Successful Event to End Stigma—So Can Yours! Is Your Chapter in the News?